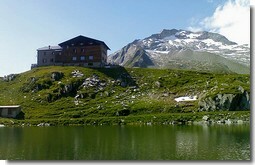 The Schlegeis-Reservoir is the starting point for many walks, mountain- and glacier tours. The Friesenberghaus at 2.498 m (ca. 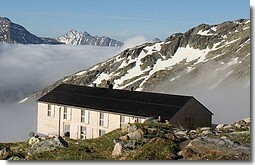 2 h), the Pfitscherjoch-Haus at 2.237 m (ca. 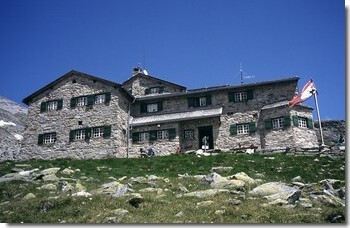 2 h), the Olperer-Hütte auf 2.389 m (ca. 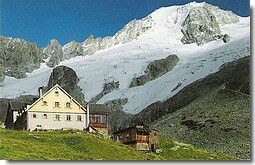 1,5 h) and the Furtschagl-Haus at 2.295 m (ca. 2,5 h) are only a few examples. For the hikers with enough stamina the Panoramaroad Schlegeis (ca. 6 h) is a fine possibility to walk from hut to hut. From the Dominikushütte through a wondeful pine forest to the Friesenberg Alm, and continuing to the Lapenkar. The hut is already visible. The road leads through the pan of the valley in serpentines to the hut. This walk goes to the Austrian-Italian border. Along the Schlegeis reservoir, at the bridge you turn to the right along the Kiosk Zamsgatterl. state border with Italy and you can walk on to the now nearby Pfitscher-Joch-Haus. Here you have a breathtaking view over the glaciers.